Piano lessons: individual or group? Whether to take individual lessons or a group piano class depends on the time and money you’re willing and able to spend to get the results you want. This is a question I get asked from time to time. The answer: it depends on the time and money you are willing and committed to spending on lessons and practice. It also depends on the results you want to get. In other words, it depends on your goals. The traditional private individual piano lessons once a week may be outdated by today’s time-challenged adults who have to balance the demands of work, study, and other responsibilities. In individual lessons, you develop a relationship with the teacher. You set the pace. Except for improvisation classes, all my piano training has been individual lessons with a teacher. I must say that group lessons were unheard of when I was growing up. Nowadays, because of time and financial constraints, group classes are not only a possibility but also a growing trend. 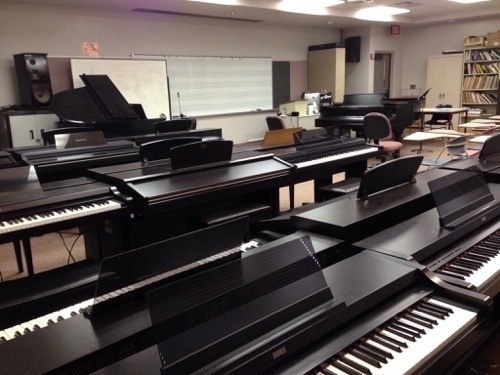 Digital pianos also make group classes possible as everyone can put on headphones. For beginners, the progress may be faster in a group setting, because of the effect of learning from and with others. The social aspect of learning in a group causes accountability and responsibility. You practice. You show up to class. You participate. You have a benchmark. If you miss a class, you have to catch up. Being able to read music notation opens a world of possibilities, for the repertoire for piano is greater than any other instrument. Once a person experiences “flow” he or she will want to do it again. This is the adrenalin-kicking, endorphin-releasing natural high that performers and athletes experience. It’s what keeps us going. Why does learning to read music work well in a group setting? Short answer: it takes less time and is more effective. Before playing a new piece of music, I get my students to analyze the patterns and discuss what they see. Everyone gets to participate. By the time we finish and are ready to play the music, most of our anxiety about tackling an unknown piece of music is gone. It takes more time in an individual setting to discuss a new piece of music. From a financial perspective, it may be more affordable to start with piano classes and continue with individual piano lessons after you’ve reached a level that requires more one-to-one time with the teacher. At University of Hawaii Maui College, Hawaii residents pay $106 per credit per semester. Consider a 2-credit piano class that meets once a week for 2.5 hours for 16 weeks (or twice a week for 1.25 hours each) versus private lessons that range from $60 to $100 per hour on Maui. You can get up to 6 credits this way (i.e. 3 semesters at 2 credits each). How big are the piano classes? We need a minimum of 10 students per class for the classes to happen. Check the Spring 2014 music course schedule for class times and availability. Is a group setting good for an absolute beginner, or is it better for someone who already has some basic experience in piano? Just curious! Thanks for the post! It really depends. Group setting has the benefits of 1) less expensive than individual lesson and 2) social dynamics – you can learn from playing with others. You also learn to count, keep time, and most importantly, listen. I like the concept of group lessons. I would like to know about these lessons.